Last night I took the first 'surgery' for the Kent Law Clinic at Medway. The Law Clinic is a service arranged by the Kent Law School at the University of Kent whereby volunteer lawyers give free legal advice and assistance to local people who cannot afford the services of a lawyer. The service is run by students, who sit in on the advice sessions. The Clinic has already been providing the service to people in the Canterbury area for the past thirteen years - for further details see here: http://www.kent.ac.uk/law/clinic/index.htm. As the Student Supervisor stated at the launch event, the service is designed to help those that 'fall through the cracks in the system', specifically those that are not eligible for legal aid yet can't afford to instruct a solicitor on a private basis. Judging by the level of interest, there are an awful lot of such people - perhaps the 'cracks' are more like 'gaping holes'. I am quite prepared to offer my services on a 'pro bono' basis, but can't escape the feeling that I am doing work that should be covered by legal aid. Following on from my post last week, The Times reports today that in an interview with him the President of the Family Division Sir Mark Potter states that the ex-wives of wealthy husbands are not entitled to an automatic half share of the assets. Apparently Sir Mark said that in most 'ordinary cases' the "yardstick of broad equality" was right, but when it came to the very wealthy the "slavish" following of a 50/50 principle was undesirable. Hmm. Doesn't this just confirm that there is indeed one law for the rich? Yesterday the Legal Aid Practitioners Group issued a press release challenging the Solicitor-General over "value for money" for legal services (see http://www.lapg.co.uk/press.cfm?press_id=219). Recently, the Solicitor-General asserted that we get value for money from the Treasury Solicitors Department, which charges "about £134 per hour", at a time when the Government is (yet again) demanding better value for money from legal aid lawyers, who get paid £50 to £60 per hour, regardless of seniority. You have to laugh...unless you are a legal aid lawyer. Not only do they get paid a fraction of what they can charge for privately-funded work, but they also have to deal with an ever-increasing bureaucracy for the privilege. Unsurprisingly, more and more solicitors are choosing to vote with their feet and give up offering a legal aid service. As a result, it is becoming increasingly difficult for members of the public to find legal aid solicitors, and when they do, they often have to wait weeks to be seen. Along with the recent increases in court fees (referred to by me in previous posts), this is another reason why the less well-off in our society are finding it harder and harder to have access to justice. You have to ask: what rights do you have if you can't enforce them? Imagine you're a parent looking after your child. The other parent has never paid any maintenance for the child. You applied to the child support agency months ago and are still waiting for them to deal with your application. Imagine your joy this morning as you see in the news that Child Support Agency staff are going on a 48 hour strike. Not that I'm necessarily blaming the CSA staff - they are doing a difficult job under enormous pressure - but surely someone is to blame whenever a strike takes place, whether it be employers, employees, or both. Meanwhile, parents looking after children continue to suffer financial hardship, which must in turn adversely affect the children themselves. Is this not just another nail in the coffin for the Child Support Agency? I often wonder what the average member of the public would say if they were told that many of the decisions made by our Family Courts were made by people who had had little or no experience of the Family Courts system prior to their appointment. At the bottom of the system we have the Family Proceedings courts with their lay magistrates, who have never even practiced law. Then we have District Judges and Judges who often haven't any (or any recent) experience of dealing with family matters. Last but not least we have the President of the Family Division who was primarily a commercial lawyer! I'm not saying that any of these people are doing a bad job, but in most other walks of life experience is a prerequisite. Even though it's now been with us for a while, I'm still not sure about the new name for the Solicitors Family Law Association. I understand the reasons for the change (getting away from the (no longer accurate) orientation towards solicitors and describing "succinctly what separating families want to achieve when they consult a family lawyer" (their words)). However, "Resolution" does not describe anything - I often have to go on to explain to clients that it is an association of family lawyers, which seems to defeat the object of the change. Further, the word 'resolution' has different meanings. Obviously, the intended meaning was to do with 'resolving issues', whereas it can also mean 'firmness or determination', which can be quite the opposite. Or am I just being pedantic? Today Mrs Axon lost her appeal to the High Court for a review of the Department of Health's guidelines which state that abortions for girls under sixteen do not need parents' consent and that doctors should respect girls' confidentiality. I'm not going to express an opinion on what is obviously a very emotive subject, save that I can't help wondering whether the guidelines are more to do with government policy to reduce teenage pregnancies than to do with the welfare of the people concerned, including the parents. "Overall net worth...£4.6 million", "[the husband] had a salary in excess of £180,000 and was worth approximately £17.5 million" and (wait for it) "the assets, said to be of the order of £100 million (gross)". These are extracts from recent cases concerning divorce settlements. As someone who has always practiced in provincial 'high street' firms, it amuses me that so many reported cases involve assets that are beyond the wildest dreams of virtually all of my clients. The reason, of course, is that most reports involve cases that go to the Court of Appeal or House of Lords, and only the rich can afford to use those courts. Yet these cases form a large part of the body of precedents to which we must have regard when advising our clients. Just how relevant such decisions are to the vast majority of our clients is a moot point. I have posted a couple of times already about Fathers 4 Justice. Today I read an article in The Observer about fathers' contact with their children, following on from recent events, that mentioned an incident where a man threatened his ex-partner's solicitor that he knew where she lived and that there would be trouble if she didn't leave him alone. A few days later the solicitor's car exploded outside her house, although no one knows who was responsible. This brings to mind something that happened to me about three years ago, when I received a letter at my home address from my client's ex-partner, despite the fact that I was in correspondence with him via my firm. Nothing followed, but there was a clear implied threat: "I know where you are". This was not a child contact matter. I'm sure many other family lawyers have had similar experiences. Perhaps we should receive danger money? OK, this blog has now been going for three days - time to get controversial! Last Monday I watched the second part of Professor Richard Dawkins' documentary 'The Root of All Evil? ', on Channel 4. In it, he proposed that indoctrinating our children with religion amounts to child abuse. This is a view I have held for some time. Can it be right to scare our children into 'being good' by threatening them with eternal hell and damnation if they transgress? As Dawkins says, we don't impose our political views upon them (or at least it is generally accepted that we shouldn't), but many people happily impose their religious views upon their children, and this is increasingly being supported by the state, which is actively encouraging more 'faith schools'. In such schools the teaching is based upon ancient religious texts of dubious origin, rather than scientifically-proven truth. Surely, this will only perpetuate the narrow-mindedness that can ultimately lead to the sort of murderous intolerance that we see almost every day in the news? I'm not saying that we shouldn't teach our children basic morals, but this doesn't have to be bound-up in religious 'mumbo-jumbo'. Let our children grow up and then decide for themselves - if we all did this then within a generation or two perhaps much of the trouble in the world would be a thing of the past. I know this is wishful thinking, but as John Lennon said: "Imagine...No religion.. Imagine all the people living life in peace..."
Following my post yesterday, it has been reported that the fathers' rights group Fathers 4 Justice is to disband, in the wake of the furore over the Leo Blair kidnap affair. As I have indicated previously, I have issues with the methods of such groups, but they have a right to peaceful protest and it is therefore unfortunate when they are undermined by extremist elements. I fully understand how emotive the issues of contact with one's children are (I have often witnessed it firsthand), but resorting to criminal activity can only be damaging to the cause and add fuel to those who argue that such activity 'only goes to prove what unsuitable fathers they are'. In another story on BBC News (http://news.bbc.co.uk/1/hi/uk_politics/4625228.stm) it seems that the government is to sell Child Support Agency debts to private firms to collect. The firms will take a share and pass the rest on in child support payments. How well this will work will have to be seen, but I suppose that the parents with care will be better off getting something rather than nothing, even though they are having to give a cut to the debt collectors (who will no doubt concentrate on the 'easy targets'). However, the fact remains that the CSA is long since beyond redemption and must surely be completely replaced. In a wonderful piece of understatement, the caption to the picture on the BBC News page reads: "The CSA has had a troubled history". Indeed. As anyone involved with the Civil Justice system will know, there has been another recent increase in court fees. Once again, this is not just an 'inflation-related' increase, but a huge hike intended to make those that use the courts pay for the system. Is this right? More and more we seem to be getting a three-tier legal system. At one end of society we have those few people who are eligible for legal aid (if they can find a legal aid solicitor) or who are eligible for a fee exemption and at the other end the wealthy who can afford to pay. In between the majority of the population are finding it harder and harder to afford access to justice. I can recall a few years ago having a client who was just ineligible for legal aid (I was then still one of the foolhardy solicitors that offered a legal aid service) or a fee exemption but who could not afford the fee to issue divorce proceedings, and I think the fee was then only £40. She was in tears and couldn't afford to go ahead. I would like to think that somehow she subsequently scraped the £40 together and got her divorce, but I'm sure she couldn't now with the fees for a divorce now totalling £340. No doubt the Department for Constitutional Affairs hope that the new fees will largely be 'hidden' behind the fact that they will be included in solicitors' bills, thereby adding to the general consensus that solicitors are solely responsible for the expense of litigation. As reported by the BBC today (http://news.bbc.co.uk/1/hi/uk/4622880.stm), Fathers 4 Justice are back in the news, although they deny any involvement in the alleged plot to kidnap the Prime Minister's youngest son. I have no problem with the basic aims of Fathers 4 Justice (although I'm not so sure about their methods), but what bothers me is the 'knee-jerk' response that their activities may generate. Having worked in family law for over twenty years, I'm just not sure that any further changes in the system are urgently needed. Contrary to popular belief, there is no presumption in favour of the mother and most courts that I have used deal with children disputes in an extremely sensitive, caring and even-handed manner, encouraging conciliation at every step of the way. The main problem with the system is delay, but that has more to do with lack of funding than the system itself. I'm not saying that we should be complacent, and certainly we should continue to look for 'better ways', but changes made hastily under pressure from the media or groups such as Fathers 4 Justice are not the way forward. Welcome to the Family Lore blog (blawg?). As the subtitle suggests, here I intend to post random thoughts related to my job as a family law solicitor practising in England and Wales. I hope that you find the blog of interest. I'm John Bolch. I studied law at Reading University and The College of Law, Chester. I was admitted as a solicitor on April Fool's Day 1985, which has always seemed somehow appropriate. For the next twenty-four years I worked almost exclusively in family law, dealing primarily with divorce, ancillary relief (financial/property settlements on divorce), private law children matters and cohabitee disputes. I was also a member of Resolution and of the Law Society's Family Law Panel. I gave up practising in 2009 and now work freelance as a writer of family law. My first book, Do Your Own Divorce was published in August 2009. My second book, An Introduction to Family Law, is being published as part of the Insite Law Free Legal Resource Project. 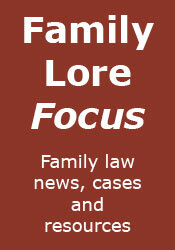 I also run the website Family Lore Focus, which includes Family Lore News, the Family Lore Case Digest and The Family Law Wiki. Please note that I will not be able to give advice via this email address.